I love on body trackers. I’ve had a Fitbit for a few years now. When I leave home without it, I feel naked. I got a BodyMedia Fit this year for Christmas. I always kind of wanted one, but I don’t like the idea of paying for the band and then paying for the service too. Fitbit’s service is free. The BodyMedia FIT came with a free three month trial. Since this is my marathon season, I figured I should use it and get some data. I’ll post a full comparison of the two once I’ve had more time with the BodyMedia Band, but here are some of the differences in data from the marathon this past weekend. One thing to note is that I got a bit chafed by the BodyMedia Fit, so I wore it for the marathon and then took it off for the rest of the day. 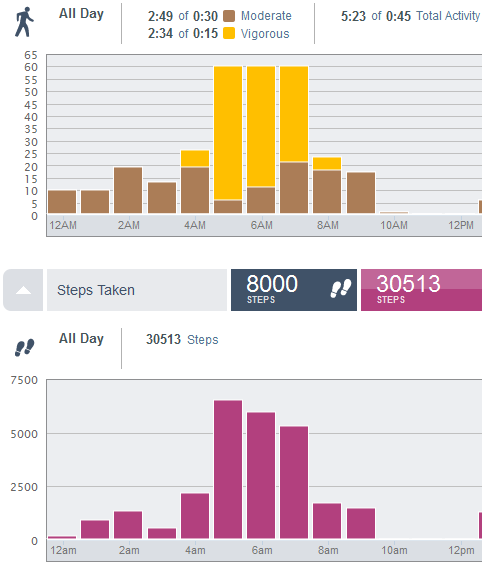 I’ve only posted data for the period that I wore both, but the “steps” on the BodyMedia data seem significantly lower. That’s because I visited a park after the marathon and I wore my fitbit, but not the BodyMedia band. Both devices give you your activity level, more or less, in Metabolic Equivalent of Task (MET). 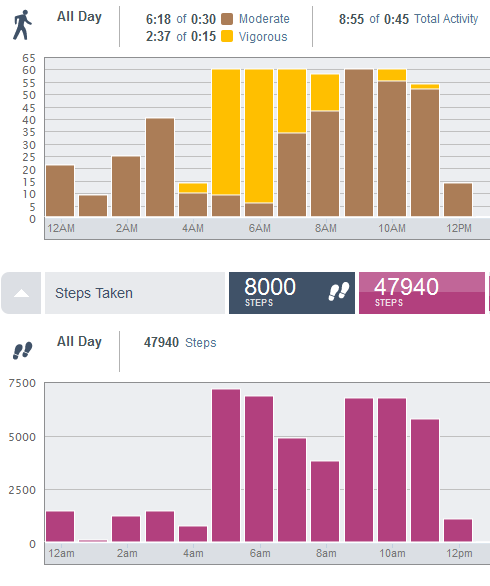 The Fitbit translates it to easy to view colors and activity levels. MET is a physiological measure expressing the energy cost of activities. It is the ratio of your metabolic rate (or energy consumption) during a specific physical activity to a reference metabolic rate. It allows you to gauge how much energy is consumed during various physical activities. Sedentary, sitting activties are rated at 1.0 METs, moderate exercise is about 2-4 and vigorous exercise is around 8. Here are the calorie overviews of the race. You can get specific time data for Fitbit by setting an activity record. However, I like the colors in the general overview. The colors on the Fitbit graph represent activity level and loosely translate to METs. The pink would be vigorous or very active (around 8 METs), yellow moderately active (4 METs) and blue fairly active (over 1 MET). For me, fairly active is walking about 20-25 minute miles or the equivalent activity. Moderate is 15-16 minute miles and very active is above that. Cross Fit earns me vigorous activity, but just weight training at home earns me moderate. It’s interesting to see how BodyMedia breaks it down into actual METs, but the Y axis for the graph is actually calories (which relate pretty closely to METs, since calories are a measure of energy consumption too). You can mouse over a time period and see your METs in the acitivity center with the BodyMedia FIT. Note that the Fitbit’s estimated calorie consumption seems higher only because the X-Axis of the fitbit’s graph is in 5 minute increments. Bodymedia elongates the graph and uses 1 minute increments (so if you’re burning 10 calories a minute, one data point of 50 looks more impressive than 5 data points of 10). The calories burned are very similar on both (1269 vs 1392), though the BodyMedia FIT band is supposed to be more accurate. You can get more detailed with the fitbit by setting up an activity record. 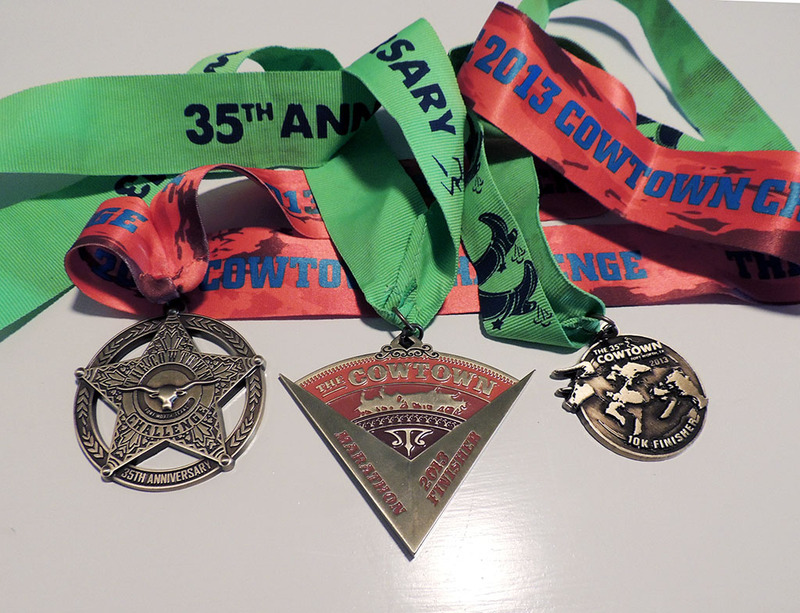 It will show pace, elevation (this marathon was fairly flat so it’s not very interesting…wait until March’s marathon. I’ll show you that one) and more. The remarkable thing is the pace and distance figured up by the Fitbit is pretty close to what my Garmin calculated and pretty close to my timing chip. 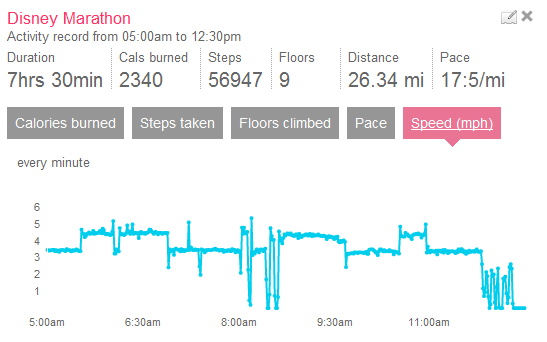 I find the Fitbit’s pace calculation is less accurate over short distances. It uses stride length. That varies, but averages over a longer distance. Even over short distances, it normally does a pretty decent job. The BodyMedia FIT has some neat color coding as well. This is the daily overview. Here’s what marathon data looks like like with these devices. You can tell the difference between running a marathon steps and visiting a park afterwards steps. No pink in those afterwards steps, which shows you that “I walk all day at work” steps probably aren’t very high METs. If you’re noticing the activity spurt at the end of the day, it’s because I noticed I had 70,000 steps and I wanted to know what the highest Fitbit badge was. A staff member told me it was 70,000, but Fitbit always displays your “next highest” badge and it was displaying a 75,000 step badge. I ran a quick few miles around the hotel to see if there was a badge after that. Turns out that 75,000 is the highest possible badge (as of Jan 2013). Just for fun, I’ll show you this graph. 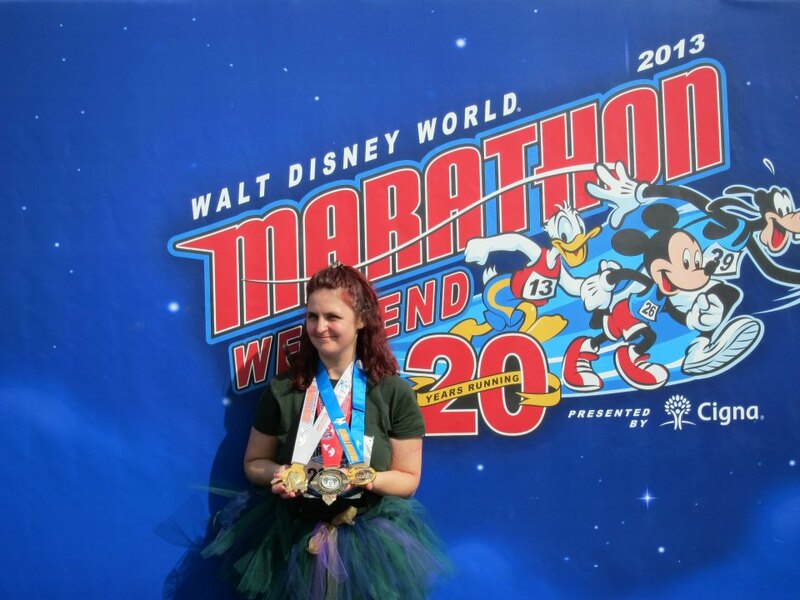 I spent all day Monday in the Magic Kingdom and walked about 10 miles, almost a half marathon. However, look at the METs. 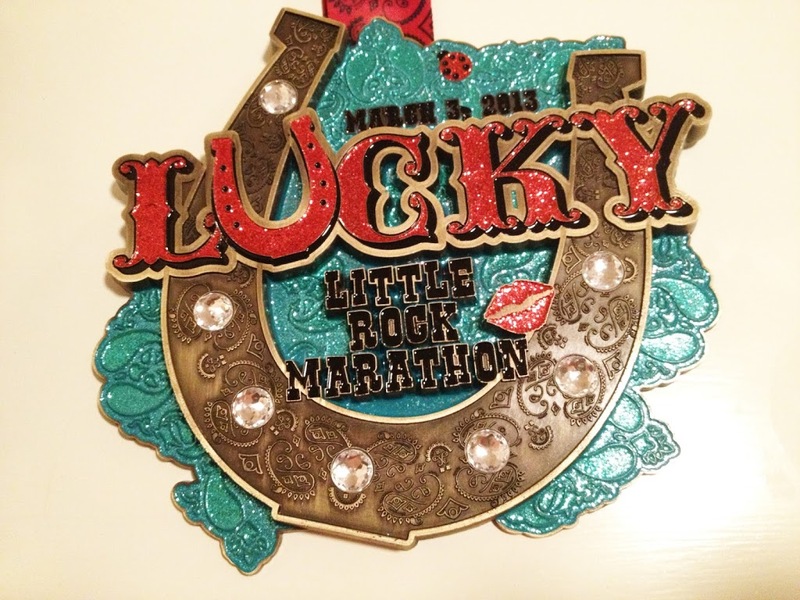 It’s nothing compared to the actual half marathon. So, “walking around the house” or work probably won’t help with physical fitness or weight loss as much as pointed physical activity. You just don’t get the amount of metabolic push needed with these moderate activities. Believe me, you don’t feel like treking around the Magic Kingdom is taking it easy. I think my feet and legs hurt more after walking around the parks than after walking the whole marathon. However, I don’t think I got much physical benefit from it. You probably need to at least be doing moderate activity to get any really health benefits. It’s arguable, and backed by some good data, that running marathons is bad for your heart too. So, you probably want to shoot for somewhere between the two graphs in your daily life. 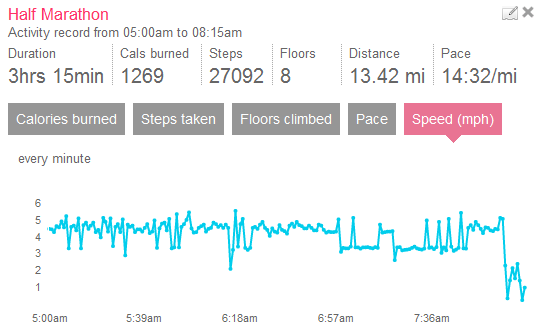 I like that these trackers do keep us mindful of exactly what our daily activity amounts too. I think sometimes we give ourself too much credit for being “active” when we’re not.